Atmospheric scientists have long blamed cattle and microbes for the production of significant amounts of methane on Earth. But the surprising discovery of a new large source of methane, a greenhouse gas that contributes to global warming, is putting trees on the hot seat. Frank Keppler, a scientist at the Max Planck Institute for Nuclear Physics in Heidelberg, Germany, and colleagues found that living plant materials produce enough methane to account for at least 10 to 30 percent of the total methane load in Earth's atmosphere. The finding, published Jan. 12 in Nature, could lead scientists to reevaluate ecosystem and climate models. 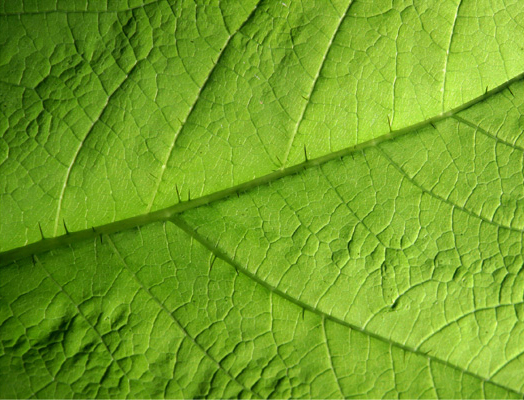 Plant materials, like this leaf, have been found to emit methane  a greenhouse gas that can lead to global warming. The collective contribution of methane from all plant materials on Earth could account for 10 to 30 percent of Earth's methane load. Image is courtesy of Ben Babusis, Lightscape Gallery. The discovery surprised scientists, most of whom considered methane generation to be primarily a microbial process that takes place in the absence of oxygen. "I think it's a very intriguing study, a very surprising result," says Robert Jackson, professor of biology and environmental sciences at Duke University, in Durham, N.C. "It goes against most of what we know about methane generation." Keppler says that he "accidentally" discovered the unusual methane production while looking at other plant-produced chemicals in prior unrelated experiments. In follow-up experiments, Keppler and colleagues studied about 30 species of plants, from deciduous trees to grasses. To distinguish between methane already in the atmosphere and that produced by plants, Keppler isolated the plants in sealed chambers from which all other gases had been evacuated, both in the lab and in their natural location of growth. The team discovered that every plant that they studied produced methane; they generated more of the gas while growing naturally in their environment and less gas after being cut. The level varied dramatically between species and also depended on conditions such as temperature and sunlight. The exact mechanism for how plants produce the methane remains unknown. Keppler hopes to continue looking for that answer, as well as for the specifics about how and why temperature and sunlight make a difference. Kevin Griffin, a plant physiologist at the Lamont-Doherty Earth Observatory in New York, says that he was initially surprised by the finding and wondered how it could have been overlooked. The reason, according to Keppler, is in part because the contribution from each individual plant is tiny. Background gases in the atmosphere have essentially masked the effect, which until now, has eluded detection by equipment typically used to look at the atmosphere. By considering all living plant materials on Earth collectively, Griffin says, the work "shows [that] the cumulative effects of small fluxes can have huge and unexpected consequences." The result is "interesting technically," Jackson says, because it potentially contributes to the "mystery of methane behavior over the last decade," as to why increases in the gas in Earth's atmosphere have slowed and even stabilized. The loss of forests could explain that drop, he says. Jackson adds, however, that more information is needed about which species contribute methane and by what mechanism, before anything can be said about a link to climate change. Plants have long been known to act as a greenhouse gas "sink," absorbing and removing carbon dioxide  the most abundant greenhouse gas  from the atmosphere. Thus, if confirmed, plants' new role as a source of the greenhouse gas methane could affect greenhouse gas emissions policies, such as those that are part of the Kyoto Protocol. Keppler says, however, that plants will continue to have a positive net effect  the benefits gained by carbon dioxide uptake will only be slightly lessened by their methane output. Also, "people should keep in mind that vegetation is important for other things, including oxygen production," Keppler says. "It's still a good idea to plant trees." The "major" environmental problem, he says, is still carbon dioxide, and "we have to focus on that."